This seems to be becoming a new habit - posting weekly mosaics. I had a lot of uni work last week, although it is nowhere near as much as I have this week. Probably should have remembered my promise to myself at the beginning of the semester, I always make this resolution - to not let my work pile up. And guess what, it happens every single time. The first picture is a key lime pie, I might attach a recipe some point soon, it's very very easy to make and very yummy to eat. Had a friend visiting this weekend who helped me make it and by help I mean he took orders and performed tasks. We actually ended up burning the top layer because my oven doesn't quite work so I was forced to put it under the grill for a few minutes. I managed to save it though, didn't have any impact on the taste, uff. The second picture is just a photo of a random block, I took it when I was playing the piano and I loved how sunny it was. The picture in the very middle is from the Pancake Day. My first ever. Was so good I had to repeat on Saturday. Right next to it are the first snowdrops of this season, I've always found them so symbolic and to tell the truth I can definitely smell the spring around already. Was 15 degrees the other day so a lot of the Brits put their summer clothes on, haha. Also I found out I like to use lemons as bookmarks, useful. 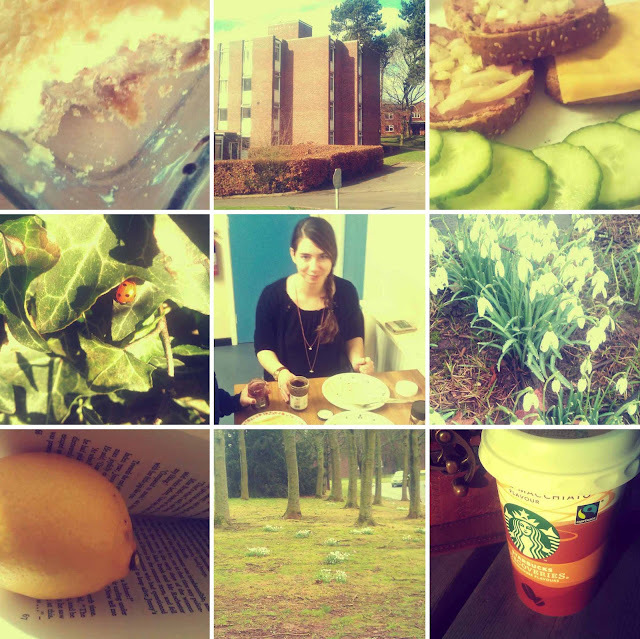 The last picture is my favourite coffee at the moment. It's Starbucks (I know, so cliché) caramel macchiato, not the one you get directly from Starbucks but the refrigerated one from the campus general store. Tastes like sweet caramel milk, my dream.